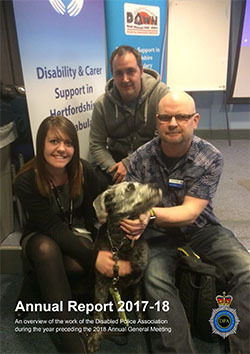 Hertfordshire Constabulary hosted the Disabled Police Association’s Annual General Meeting at Force Headquarters in Welwyn Garden City, Hertfordshire on the 28th February 2018. It is the first time that the Constabulary has hosted a meeting of the national association, which was facilitated by the force’s own Disability and Carers Network (HDCN). The Disabled Police Association is the national body representing disability support networks from police forces across the UK. It aims to promote equality of opportunity for disabled people working within the extended police family. 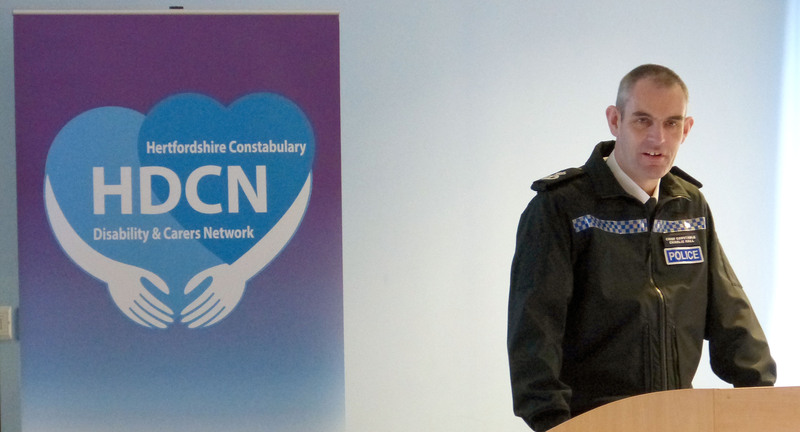 Guests were welcomed by Hertfordshire’s disability champion Superintendent Dean Patient, and the conference was formally opened by Chief Constable Charlie Hall. He said: “I am proud that Hertfordshire Constabulary has, for the first time, hosted the Disabled Police Association’s annual conference. “Since joining the Force as Chief Constable in 2016, I have made it clear that supporting people who face daily challenges through disability should be a priority within the Force. Our workforce is our greatest asset and work to ensure that the Constabulary, and indeed, police forces up and down the country understand the issues that face those with disabilities or caring commitments, so that we can support them to give their best, is extremely important. The conference included a number of guest speakers including Vice-Chair of the Police Federation Che Donald, Kate Nash from Purple Space – a networking hub for disabled employees – and Hertfordshire Police and Crime Commissioner David Lloyd. Remote captioning technology was used throughout the day to ensure the speeches were accessible for those who are deaf or hard of hearing. Mr. Gurney, who is seconded from the Force as President of the DPA, said: “It was a great honour to hold the annual meeting of the Disabled Police Association in Hertfordshire, especially during my tenure as President. Despite the snow, many representatives from Forces right across the UK attended and were able to celebrate the positive contribution that disabled people are making towards policing. “We are delighted to have enhanced the expertise of the national executive committee following the election of a number of new members who bring experience and enthusiasm to our work. This year heralds the start of improved support to policing from our association with increased social media coverage and staffing resilience. “The annual meeting provided an outstanding opportunity for the Disabled Police Association to outline its future support to the police service in delivering the objectives set out by the Government’s white paper entitled Improving Lives: The Future of Work, Health and Disability. David Lloyd, who is also Chair of the Association of Police and Crime Commissioners, closed the conference. He said: “I was very pleased to see Hertfordshire Constabulary hosting such an important event. The theme of a lot of discussion during the day was a collaborated approach to achieving best practice. “We heard a lot about the significant progress being made across policing, especially recognition that disability presents itself in many ways, and the work being done around the mental health of our staff and officers.